Lukas Nelson and his band Promise of the Real paid homage to Levon Helm, The Band drummer and vocalist, Tuesday night during a 2 hour and 30 minute live webcast from Bob Weir's state of the art TRI Studios in San Rafael, Ca. Earlier this week, Helm, 71, announced that he was in final stages of throat cancer. Lukas dedicated The Band song "I Shall Be Released" to the iconic musician. 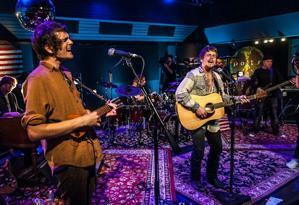 "The next song is a tribute to Levon," Lukas said. "He's a little sick right now. So we're all giving him prayers." Lukas said "I Shall Be Released" is one of Helm's favorite songs. "I know that Levon loves that song and Richard Manuel was a good friend of his and was one of his favorite people and he does a great version of that song," he told Yahoo! Music. 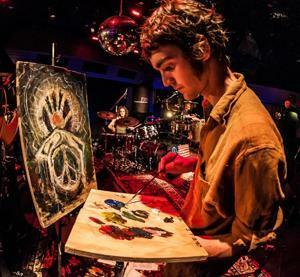 The set also included covers of the Rolling Stones's "Sympathy For The Devil," Neil Young's "Down By The River" and Buffalo Springfield's "Expecting To Fly," which Lukas performed with his brother, Micah, who played a charango and provided live painting throughout the set. "'Expecting To Fly' is one of our favorite songs," Micah said. "We've been jamming it together for a while now, and yesterday he was like, 'Hey do you want to do it?'" Lukas and his band's set encapsulated a bit of blues, rock, soul, folk and picks from their two albums, 2010's "Promise of the Real" and the recently released "Wasted." Lukas, the son of the legendary Willie Nelson, inherited his father's vocal tone and penchant for singing about marijuana. But his persona on stage Tuesday was all his own, fluctuating to match the mood of his songs. Lukas knew comparisons to his father were inevitable, so he was determined to find his own way. "Everybody's always going to be comparing me, talking about, 'Oh is he good or not?' Or 'Is he with his dad or not?' So, I decided that I was going to start playing for myself." During the live stream, Lukas played guitar while jumping up and down when performing the brash, rock-heavy "Wasted," "Start To Go" and "Heart Of The Matter." He took a melancholy approach to playing more somber songs "Joint," "Wasn't That Great" and "Ocean." Lukas added an acoustic rendition of "Amazing Grace" as an intro to his song "2012: The Happy Ending." "I just started doing that a couple days ago," he said. Micah said he likes that Lukas's concerts are unpredictable. "One thing I love about my brother's band is just the free flow [approach]," he said. "The set is different every time."